Forever Today is Clive’s story, but it is also Deborah Wearing’s story – Clive’s second (and third) wife, several years his junior. Most remarkable is their pure, true love that transcends space, time and consciousness. Deborah nurses Clive for many years before finally divorcing him in an attempt to lead her own life in New York. She realises her heart will always belong to Clive and remarries him. They remain married today. “Love was always my way of getting through to Clive whatever the circumstances…One thing he did know for sure – he knew he loved me, he knew I loved him, he knew we were one, and he knew that came before everything” (177). The other thing that gets through to Clive is music. In the early days of his illness he went through a bout of crying that lasted weeks, soothed only by playing his keyboard. It is a complicated business, the brain, but Deborah Wearing uses metaphor, description and events to help us understand why Clive retains some things and not others, why he can still play music but doesn’t recognise his own son. “I came in that day and saw Clive holding something in the palm of one hand, and repeatedly covering it and uncovering it with his other hand as if he were a magician practicing a disappearing trick. He was holding a chocolate. He could feel the chocolate unmoving in his left palm, and yet every time he lifted his hand he told me it revealed a brand new chocolate. ‘Look!” he said. ‘It’s new!’ He couldn’t take his eyes of it” (126). 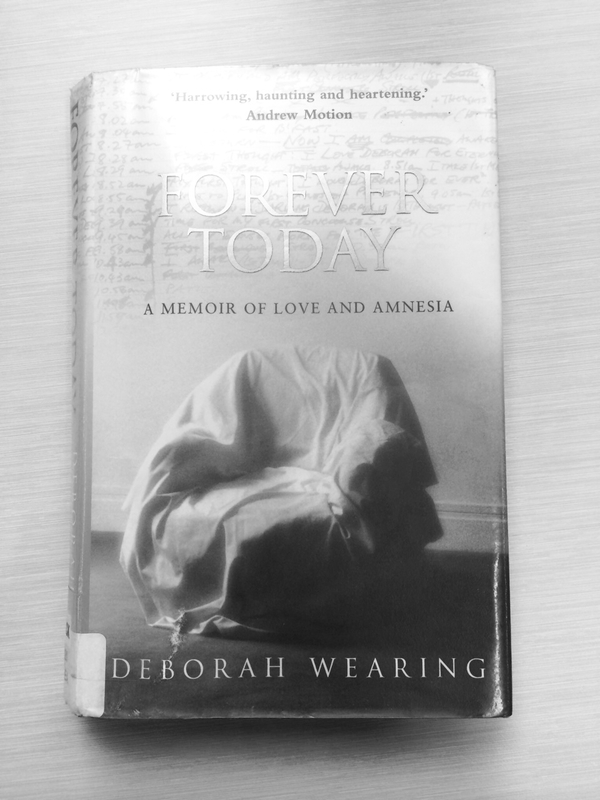 ‘Forever Today: A Memoir of Love and Amnesia’ by Deborah Wearing, Doubleday, London, 2005. Deborah Wearing is an incredible woman. Her work for brain injury victims is inspirational and rose out of a disbelief at the lack of resources available for Clive, particularly the non-existence of a long-term care facility. She has given her life to Clive, and finds light in the darkest of places. Her life and marriage is unconventional but shows us we can all find hope in the darkest of places, it’s all in how you choose to look at it. Deborah Wearing’s talented writing skills set this memoir apart from the other amnesiac memoir I have read (I Forgot to Remember: A Memoir of Amnesia by Su Meck). Wearing uses just the right amount of detail and description and best of all are her metaphors: the dying bracken plant as a symbol of their love (67); dust in the wine glasses as their lives disintegrate (197) and best of all the image of Jacqueline Kennedy holding JFK’s brains in her white gloved hand as a metaphor for the compulsion she felt to raise awareness for Clive’s plight (248). Amazing. “There was dust in the wine. Clive kept clinking glasses because he didn’t know he’d done it before. It felt like we were drinking the dust into our hearts…And the minutes and the hours were all the same, same question after same question without respite, piling up in my mind like sawdust. With every hour, it seemed we were disintegrating” (197). I first heard about Clive Wearing through a talk by Michael Corbalis on Mind Wandering. 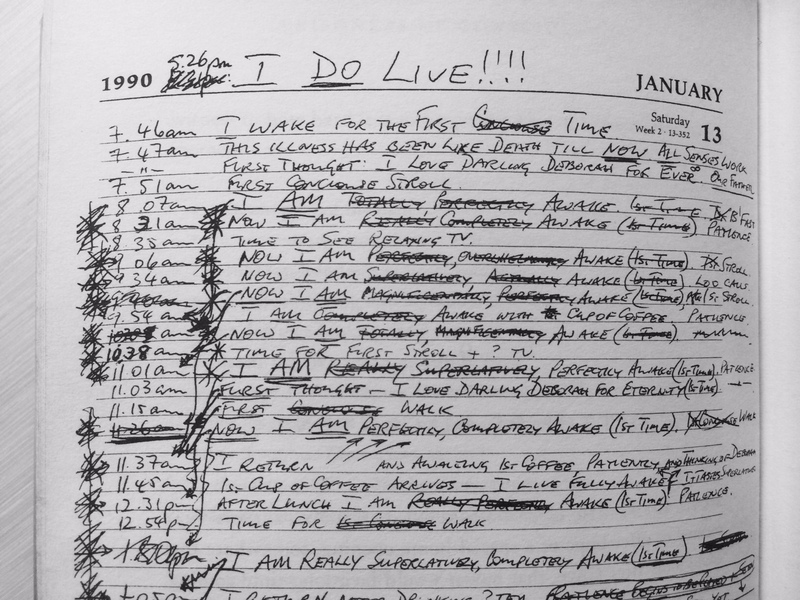 I can also recommend the BBC documentary The Man with the 7 Second Memory from 2005 which brings alive Clive’s loop conversations and diary entries alive. I have yet to watch Equinox: Prisoner of Consciousness (1986).